REVIEW: Discover the Power as Insight Editions unleashes the History of Power Rangers with Power Rangers: The Ultimate Visual History (hardcover book). Power Rangers: The Ultimate Visual History is absolutely the best product of Power Rangers’ 25th Anniversary and was Years in the making. Purchase your copy of Power Rangers: The Ultimate Visual History Today! *Last release date was set for September 25th, 2018. *Release date was set for November 7th, 2017. *Original release date was set for February 28th, 2017; discovered on July 3rd of 2016. This is your time! Discover new things! 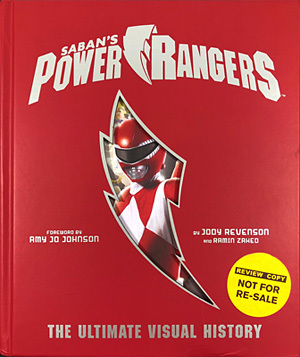 Power Rangers: The Ultimate Visual History takes us on a trip with over 250 pages full of information you never knew, spanned across all 25 seasons, and the three movies. This extraordinary book includes never-before-seen concept artwork, behind-the-scenes photos, interviews and much, much, more. This is a must-have for all Power Rangers Fans. *Discover what scenes were cut from Turbo: A Power Rangers Movie; Originally titled Power Rangers: Race to the Volcano. *Discover what was originally planned, and filmed, to happen to one of the Rangers in the Power Rangers Time Force finale; and to whom. *Discover why Valerie Vernon who played the Lost Galaxy Pink Ranger left the show. *Discover why the new seasons have been split into two years. *Each chapter has something new to be discovered at the turn of a page. 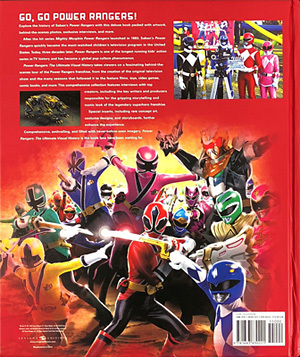 *The book also includes Toys, Comics and Power Rangers HyperForce. End note: We find it totally awesome that Insight Editions plants two trees for every tree used to make the paper for these books.